Hi, everyone!! Today I am going to write the circulon premier professional review for cooking lover friends. Cooking is an art and technology for preparing food using heat. Nature gives us a bunch of beauty to enjoy as well as a lot of food to eat. A vast range of ingredients is there widely across the world; you just have to utilize those. The importance of good cooking utensils comes first here. Using fire for cooking is a unique activity for human, nowadays induction cookers are invented to make things easier. Modern cooking applies smart cookware that comprises of cooking vessels, saucepans, frying pans, pots and other kitchen utensils with advanced techniques. The choice of cookware materials has a significant influence on your pocket and cooking performance. Reading this Circulon Premier Professional review can help you to choose the right one. At present Circulon Premier Professional, 13-piece Hard-anodized Cookware Set has become very popular within a short time. Whether you are a chef or a homemaker, if you are a cooking lover, select the right cookware from the right company. Nonstick cooking sets of cookware industry “Circulon” require little or no oil for the kitchen, which ensures you healthy food habit. Circulon has been revolutionizing the cookware industries since 1985 and setting standards for the best cookware continually with pride. Circulon promises you a unique range of cookware with durable non-stick surfaces and guarantees lifetime cooking pleasure with its performance. The World’s first hard anodized cookware creator Circulon is a well-known brand today for their unique circle technology. It had also been granted an Australian and US patent by 1989. They are at the forefront of the non-stick cookware industry by continually applying new technologies to invent improved kitchen items. Not sure which one is right for you? 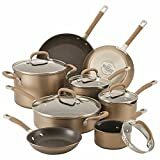 Here I am going to present you briefly a Circulon Premier Professional 13-piece Hard-anodized Cookware Set review. This set comes with beautiful chocolate colored stainless steel base suitable for all stoves and inductions. Extraordinary – Awesome chocolate bronze color and TOTAL Food Release System make the cookware set extraordinary. Safe for use – The cookware is made with advanced 3-layer nonstick from DuPont that’s why it is Safe for use. Easy to clean – The cookware is dishwasher safe and very easy to clean. Heats quickly and evenly – The cookware is made of Heavy gauge hard-anodized that features are Heats quickly and evenly. This cookware set is packed together with all of the basic pieces for regular & occasional usage. They are assembled to fulfill the requirements of your specific needs. Even after 30 years, circle technology of Circulon is still proving to outlast among all other non-stick pans in the market! In addition to their popular hard-anodized cooking utensil, the range also extends to stainless steel, non-stick and colored non-stick cookware. Besides, a variety of utensils, gadgets, knives, kettles and other essential pieces are there to make your daily cooking hassle-free. Such a vast range of kitchen utensils can make you confused which is a normal fact. Choosing the right Circulon cookware and the size and shape of cooking vessels are generally determined by how you will use it. Though there is a great variation in the actual shapes of pots and pans, typically most of them are roughly cylindrical. Circulon Premier Professional 13-piece Hard-anodized Cookware Set offers you to meet all-purpose requirements of cooking. As it is named, this cookware set includes 13 pieces of hard-anodized cooking utensils in it. You can get a truly unique groove patterned nonstick surface, but Food grimes never stuck. This property differentiates it from other traditional cookware. Eye-catching chocolate bronze color easily enhances the elegance of your kitchen interior that upgrades your cooking experiences. 13-Piece Hard-Anodized Cookware Set makes your day, lots easier and simple. It is a perfectly hard-anodized cookware set and has some specialty in typical stainless steel cookware and others. With Autograph, an improved non-stick system of DuPont, the 3-layered nonstick surface is also safe for use with metal utensils and easily washable. This cookware heats evenly and quickly that allows you to cook food perfectly. It doesn’t produce hot spots which may burn your food. It shortens your cooking time and consumes less energy. The stainless steel handles with rubberized coverings are heat resistant and more comfortable grip which secures the pots and pans. The shatter-resistant glass made lids have stainless steel rims. You can also monitor your cooking process through the glass without losing flavor and moisture from it. The pieces are dishwasher safe and oven safe up to 400°F as well. Isn’t it quite impressive? The first difference between Circulon premier professional and symmetry is the price that you’ll notice. Circulon premier professional costs more as it has 13 pieces where Circulon symmetry has only 11 pieces in a set. The second one is under the warranty period. Circulon premier professional offers a limited lifetime warranty where Circulon symmetry offers a hassle-free lifetime guarantee. Other than those two differences, both have the same features and benefits. They are both constructed from hard-anodized aluminum, has shatter-proof glass lids, dishwasher safe, oven safe, etc. Here, we’ve summarized the comparison between Circulon premier professional and Circulon symmetry in a table. Hope, it’ll help you to get an overview. Here, Circulon infinite costs less than Circulon symmetry because of material and number of cookware in a set. Circulon Symmetry has 11-pieces where Circulon infinite has only 10-pieces. Both have similar types of features except for some tiny differences. For example, Circulon Symmetry has glass lids where Circulon infinite has stainless steel lids, and symmetry cookware set can withstand up to 400 degrees F where infinite can withstand 500 degrees F.
Moreover, infinite doesn’t provide rubberized handlebar. So, symmetry has extra comfort and more grip than infinite. However, we’ve summarized the comparison between Circulon symmetry and Circulon infinite in a table. Let’s have a quick look. You’ll notice some differences between hard anodized aluminum made cookware and stainless steel cookware while cooking. Mostly, you’ll have advantages with hard anodized aluminum. It is energy efficient as it heats up pretty fast. It is more durable than other materials available in the market. It also takes less time for cooking. Circulon uses 3-layer non-stick coating from DuPont which is very durable. It doesn’t peel off easily. Other products may use 1 or 2-layer coating which comes off easily. This reinforced non-stick coating makes cooking healthy with less oil. You won’t have to worry about burning the food. The handlebars are made of silicon and stainless steel for extra comfort and durability. It features double-riveted handlebar which also adds more strength. You can wash the set with your dishwasher. So, maintaining is no hassle at all. This cookware set is also oven proof and can withstand up to 400 degrees of heat. It’s Fahrenheit by the way. You can use them for any dish you want. The glass lids have stainless steel rims and shatter-proof tempered glass. So, if they fall by accident, you won’t have to worry about it. The Circulon premier professional comes with chocolate bronze color and total food release system of raised circles which makes sure of longevity and reduced surface abrasion. The uniqueness of circle technology and the non-stick performance combination Circulon Premier Professional 13-Piece Hard-Anodized Cookware Set is consistent with its quality. Circulon Premier Professional review from users helps the company to improve their products day by day. So, Get a healthy cooking solution from Circulon Premier Professional Cookware that offers extreme durability and non-stick performance. The nonstick premium quality formula will surely make your day by surprising your family and guests with the best low-oil cooking performance. Hope it will help. Wonderful set of pans, the thick bottoms ensure even cooking and clean so easily. No complaints. Had them a year now and they are still in great condition. I am fully agree with reviewer. The Circulon Premier Professional 13-piece Hard-anodized is a awesome cookware. Cook great, cleans easily, love the strainers on the pots, handles and tops stay cool. Looks so pretty in our kitchen. Only thing I would suggest is to shop around. I don’t know Circulon Premier Professional Review is biased or unbiased review but I have no doubt about the quality Circulon Premier Professional cookware. Yes, You can go for it , hope never loss your money. Thanks a lot for your comments. We always try to write unbiased review for our reader. Readers benefits is our first priority. Here Circulon Premier Professional Review is also an unbiased review that you can trust. Awesome reviews from Sharon. It is known to me that circulon premier professional is a quality cookware set. Finally your Circulon Premier Professional Review makes me more confident and Happy. Thanks a lot for your time and beautiful site.